For Archer Scavenger Hunt 2016 I created this six minute ASCII animation to fill in the back story of Dr Krieger's pets and their perilous journey from New York to Los Angeles. The story is loosely based on the movie Homeward Bound. The first thing I did was a proof of concept animation. I made a walk cycle for each character – common practice in regular animation, but in the text-based ASCII genre elaborate movements are almost completely unheard of. I assume because of how archaic and tedious the whole process is. No mouse, no stylus, no keyframes or other modern crutches. The only tool is a simple text editor (ok, so there's a few ASCII drawing programs but I found them unsuitable for creating frame based animation). Creating ASCII art is a slow process – the visuals are created by typing different letters, numbers and symbols, often trying different combinations until you achieve the desired look. ASCII animation is no different, except you have to do it hundreds, maybe thousands of times. Each 'frame' is made up of just 14 lines and 65 columns, and one of those lines is wasted by a number that tells the computer how long to display that frame for. A successful animation test inspired me to take the idea further. Once the walk-cycle was complete, I could see the potential in developing this into something much more ambitious than your typical run-of-the-mill ASCII animation. Seeing the long, tedious path ahead of me, my friends doubted my sanity, but undeterred, I soldiered on. To be more than a neat demo it needed a story behind it, a narrative that could stand up on it's own. Something with a beginning, a middle and an end. The idea of a Homeward Bound homage was suggested by the producers but it needed fleshing out. With nobody volunteering to help, I came up with a basic outline that fit into the Archer universe, then expanded it into a six minute short film script. Then it was full steam ahead on the animation. The finished ASCII text file was 29,457 lines long with over 1.8 million ASCII characters, a significant number of them placed by hand. 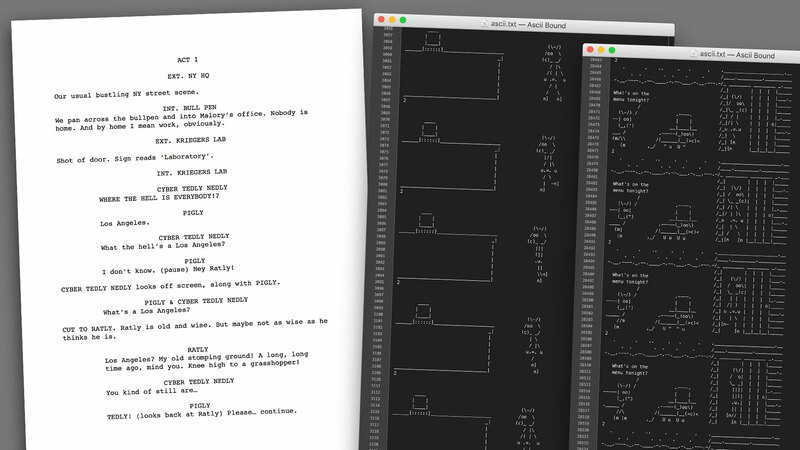 My ASCII Bound script beside some 'frames' of animation taken from the 29,457 line ASCII text file. I would be a maniac if I didn't at least try to find a few shortcuts. Copy and paste helped out a lot, but it was not without it's problems – in a text file, every line and column is connected to the next so any disturbance can wreak havoc and throw everything out of alignment. I discovered that the program TextMate has a unique feature that allows you to drag a box over an exact multi-row section without selecting entire lines. This helped a great deal. Standard copy & paste vs TextMate's advanced multi-row copy & paste. I almost forgot to mention, the whole purpose of this endeavor was to simply hide a puzzle for Archer Scavenger Hunt 2016, which was underway at the time. ASCII Bound was ostensibly created by the show's resident mad scientist and possible scavenger hunt mastermind Dr. Krieger, who would reveal his ASCII creation to the world in a tweet which would link to the animation's YouTube page. 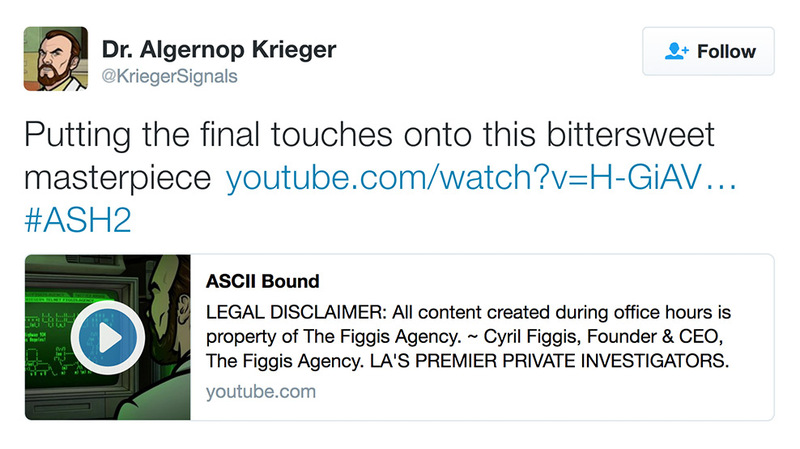 The YouTube version of ASCII Bound features Krieger admiring his creation. His computer screen reveals he's watching the animation on Telnet, an antiquated text-based way of connecting to the internet that pre-dates the rich visual web we know today. The address is telnet figgis.agency and to the delight of the scavenger hunters, the address was real and the animation could actually be watched on Telnet in it's native text-based state. The link opened up a whole new dimension to the scavenger hunt and players willingly jumped down the rabbit hole. 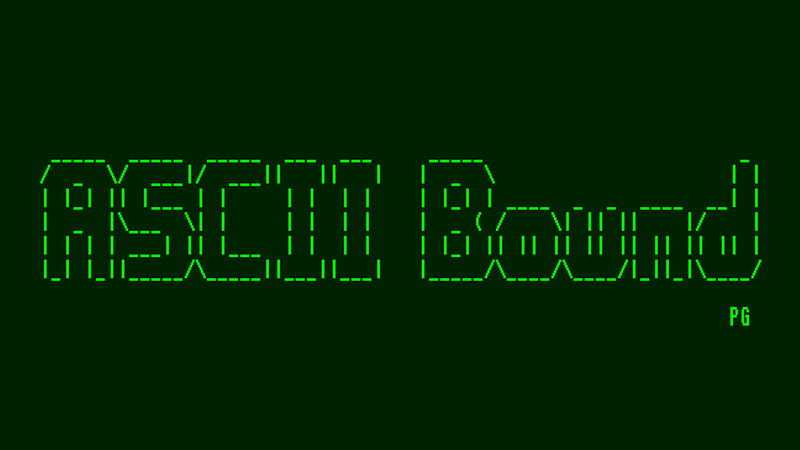 ASCII Bound, as seen on YouTube.